The horn spans four plus octaves depending on the player and uses both the treble and bass clefs. In this chart it is assumed the player is using a double-horn with F and Bb sides. The number 1 indicates that the index-finger valve should be depressed, the number 2 indicates that the middle-finger valve should be depressed and the number 3 indicates that the ring-finger valve should be depressed. There are eight possible valve combinations among the first, second and third valves: 0, 1, 2, 3, 1-2, 1-3, 2-3, and 1-2-3. 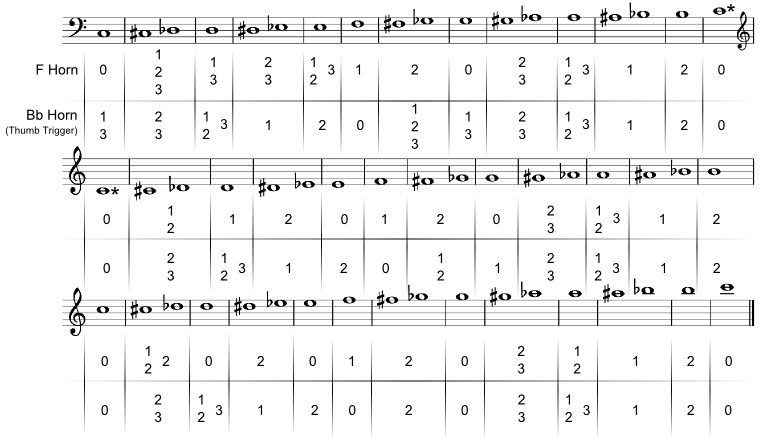 However, there are effectively seven combinations, because 1-2 will produce the same notes, perhaps slightly out of tune, as 3 alone. One depresses the thumb key to use the Bb side of the horn. This page was last edited on 30 October 2017, at 13:25.